This was my first proper shop in The Body Shop and I loved it. Before I went into the shop I Tweeted and asked what products people recommended from here and a lot of people said, the Camomile Butter and the Pinita Colada shower gel so obviously I had to get them. I spent a good 40 minutes in the shop, having a proper browse and reading a lot of products that I thought would be good for me. 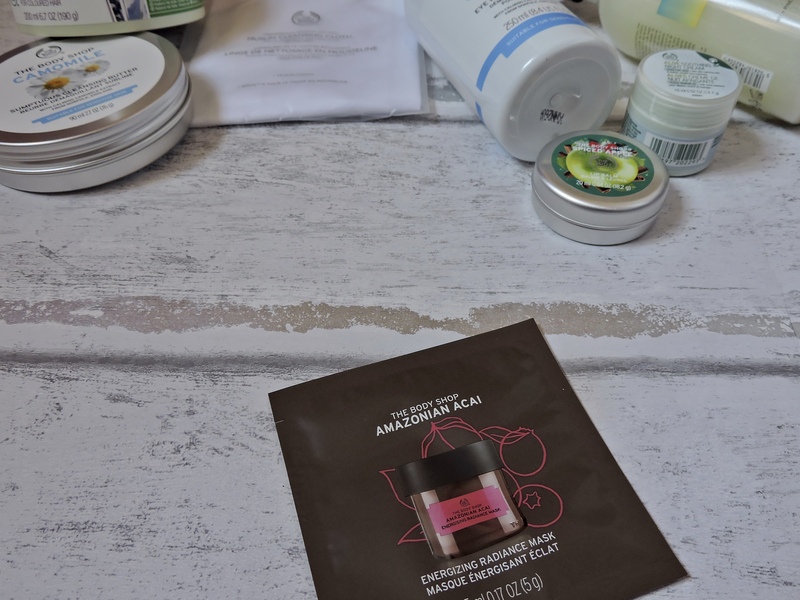 I have been absolutely loving using these products, although I haven’t actually used the Muslin Cloth as I am scared to get it dirty, but maybe I should just take the plunge. 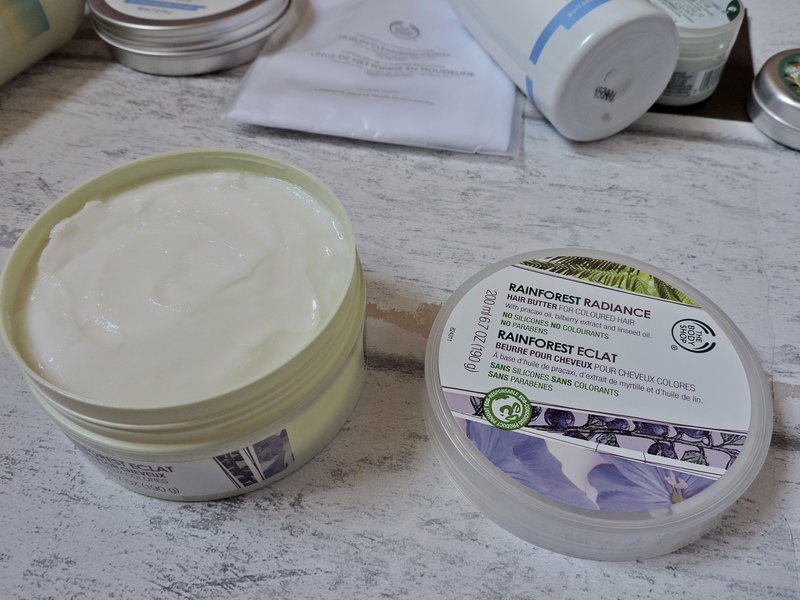 This cleansing butter is so nourishing and moisturising for my face as I sometimes get dry skin, this has definitely helped to keep my skin hydrated. I get really excited to take my makeup off as using this is really enjoyable to use. I have never used anything like this before, and I love the idea of the butter melting away any of the makeup on my face. I love Camomile it is really good for helping you sleep and me using this to take my makeup off before bed is really nice. It is so easy to use, but I definitely enjoy taking my makeup off from using this then the eye makeup remover. I would 1000% recommend using this! The Camomile makeup remover I have also been loving as once again it makes me feel good when I use it before bed. It takes my makeup off really nicely and it isn’t harsh on my eyes. I know that the Camomile is only going to do my eyes good and this makes me want to use it even more. The liquid inside is like water which is probably better for the eye area as you don’t want anything to heavy such as the butter. I would also recommend getting this, because it really doing the job well and goes well with the butter. I LOVE LOVE LOVE LOVE LOVE THIS STUFFFFF!!! it is so good for my hair. I wish that I had come across this product before. It is so moisturising for my hair, which is good because I dye my hair blonde and it works so well to keep my hair in good condition! Since using it I have noticed such a big difference with how healthy and strong my hair feels. My hairdresser even said to me the other day, your hair is so much thicker and I think it is because I have been using this stuff! It smells absolutely amazing, it has such a nice refreshing smell! It has instructions on the back of the tub, telling you how to use it and I feel like I am early addicted to using this as I always want my hair to feel how it feels when I use this!!! This item was on sale for £4 which I think it PRETTY BLOODY GOOD!!! I wish I brought two now. If you dye your hair and have really dry ends, THIS IS GOING TO BE YOUR BEST FRIEND. This is going to add moisture back into your dyed hair and give it what it needs to be healthy again. You leave it in your hair for 5 minutes and if 5 minutes is all is it going to take to get my hair feeling this good, then I am going to be using it all the time! I so wish I had found this product earlier as it is currently my favourite product that I am using at the moment. If you get this or already have it, let me know what you think because I 1000% know that you will LOVEEEE IT! I had seen a lot of people raving about this on Instagram and everyone was telling me to get it, even when I went into the shop the lady told me that this was a really popular shower gel. A lot of people seem to be loving it and I can see why. It smells absolutely delicious. It makes me so happy when I use it as I think of the cocktail Pinita Colada and it makes me feel like I am somewhere hot, on the beach sunbathing with a cheeky Pinita Colada in my hand! It is such a summer scent, which is perfect for this time. This is going to be the shower gel that you ARE going to want to take on holiday with you. Even the first time I used it, I really enjoyed using it and now just because of the scent but because it foams up a lot and creates lovely bubbles to scrub yourself with. This made me so happy. I found that the smell lasted for a good amount of time after I finished in the shower, I could smell my arm and still smell the Pinita Colada, I would think “dammmnnn I smell good!” This was like £3 which is such a ridiculously good price for this. I also think that this would be such a good present for someone, they have such a wide variety of shower gels that there is bound to be something for everyone. It’s just a bit more special as it is from the Body Shop so you know it is going to smell amazing. I love eye creams. They make my under eyes feel so refreshed and ready for bed. The cool cream under my eyes really gives them a little extra soothing before I hit my pillow. I just think these sort of products should be such an essential part of your bedtime routine as they don’t give the same affects as a normal moisturiser would. The consistency comes out really smooth under the eyes, it is really easy to blend. A little bit goes along way, this is only a small pot but I know it is going to last me a while. When you first put it on your face and rub it in, it is tacky for a second and then it fades into the skin which is one thing I love about it. I have used this in the morning a couple of times and it makes my eyes feel so awake which is something I love, as sometimes when I am rushing for work this helps my eyes to be awake quicker, if you know what I mean? I love that it has a subtle Aloe Vera scent, which is great as you don’t really want a heavy scented eye cream. I would definitely recommend buying this as not only does it make your eyes feel better but it also makes you feel better for using it. THIS LIP BALM MAKES ME SO EXCITED FOR CHRISTMAS!!! IT’S SPICED APPLE!! MY FAVOURITE CHRISTMAS SCENT! so you know that when I saw this in the shop, I was going to buy it straight away!! Since purchasing it, I have only used it a couple of times as I actually want to save it for Christmas. LOOK HOW BEAUTIFUL THAT GREEN COLOUR IS, IT IS STUNNING! 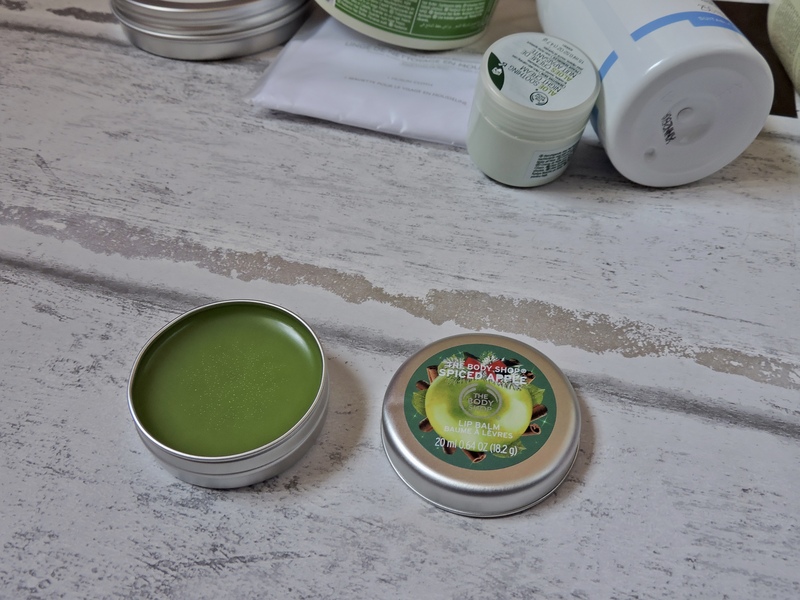 I think it is such a pretty green colour and I love how the balm is actually green to represent an apple. With some lip balms it is clear with just the scent of whatever. It doesn’t come out green on your lips it is the normal clear colour, that smells amazing can I just say. When I saw that it was green I was like oh my gadddd, I love it even more! it is really moisturising for your lips and it isn’t like a sticky lip balm which I love. It sits really comfortable on your lips and it doesn’t feel like you have a lot of products on your lips which is good. When you use it, your fingers don’t really get sticky from the balm which I quite liked as I always find this annoying. I just find that it is a really nourishing, simple lip balm that is really nice to use. I really like that it is in a little tin aswell, I thought that was quite different and cool. One of my favourite things about it, it that it SMELLS LIKE CHRISTMAS! My favourite Christmas scent is spiced apple and cinnamon and this lip balm is like Christmas in a candle for me guys, if you need a great lip balm with the bonus that it is Christmassy, you need this! The lady kindly gave me a sample of the Amazonian Acai Face Mask, which I was excited about as a lot of bloggers have been trying this and seeming to love it. If I am correct, there are five new masks out, that have all been brought out by five bloggers. When the lady asked me if I wanted a sample, I was like SURE! I have to support my fellow bloggers now don’t I? I haven’t used the mask yet as I am waiting for a time when I feel like my skin needs it the most! I know it is going to be amazing though! after reading this post I want to take a trip to the body shop! The body shop sounds like my kind of place! I have 2 body butters from here and I LOVE THEM. Great purchases I might have to go yt some out. I always think Body Shop products are fab instant pick-me-ups thanks to how fab they smell. 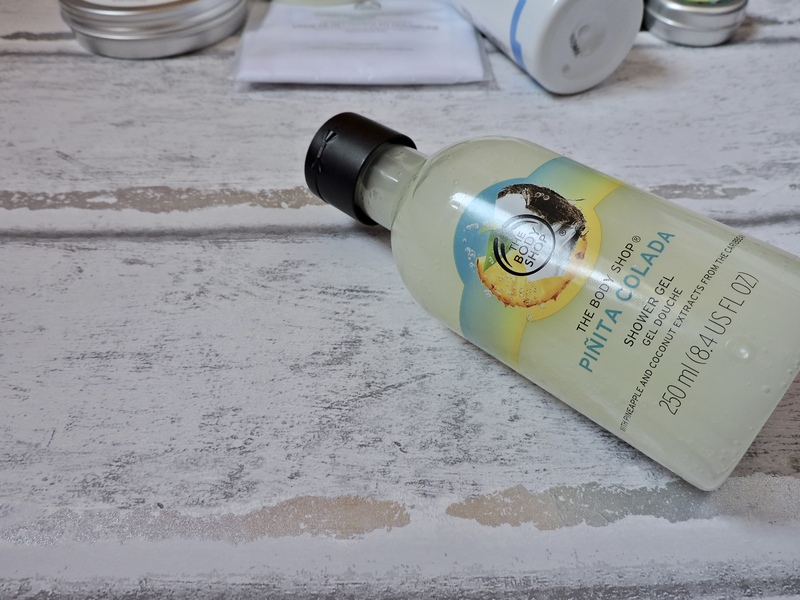 That Pina Colada shower gel is such a genius idea for summer! Oh god my poor bank 😂 Thank you!! HAHA! no worries, I’m glad you liked it! What do u use the hair butter for ? Is it like conditioner ? They body shop is my go to store for anything to do with my skin. Their products are amazing! I can see why! they are so good, especially when they have a sale going on! I haven’t bought anything from the body shop in years. I think I was over saturated with it at one point early 2000s when everyone was having bodyshop parties at home. I am going to have to go and check out a store though I keep hearing wonderful things. 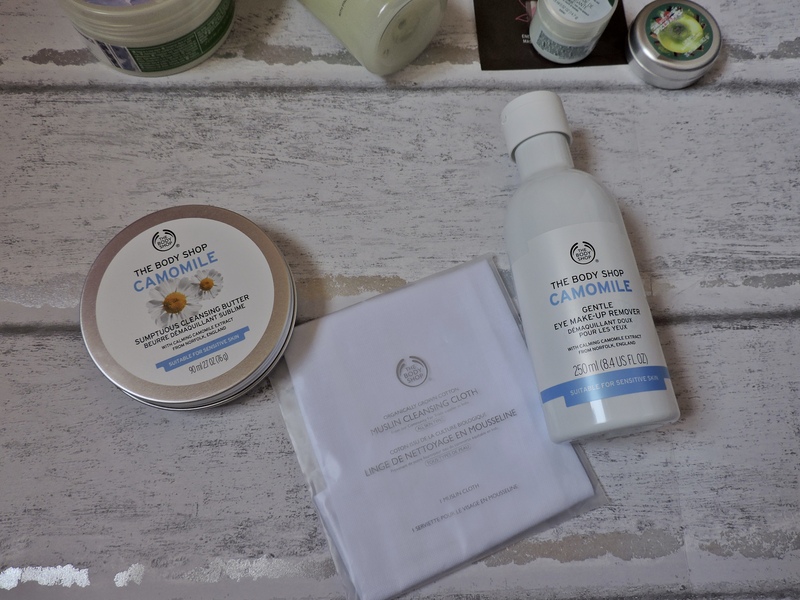 The body shop always have such amazing products! I didn’t know they did muslin cloths, I’m gonna have to pick one up! 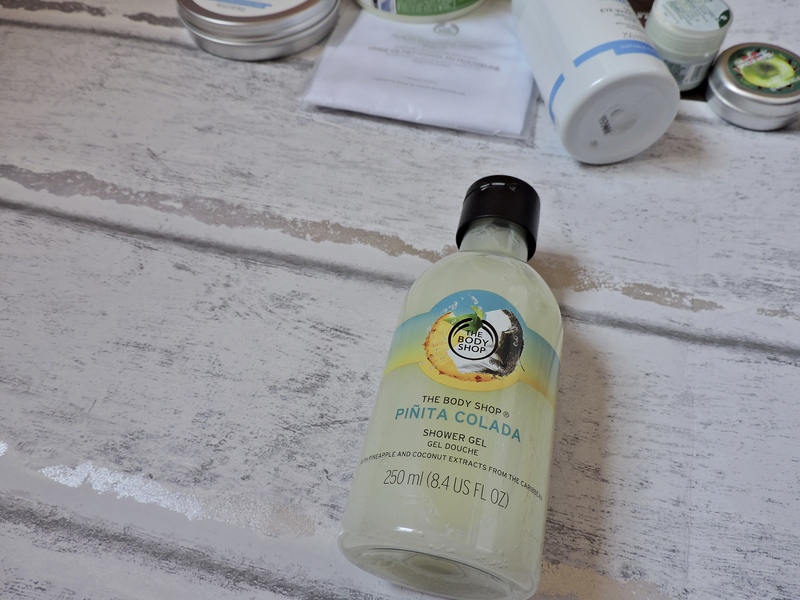 The Pinita Colada shower gel is what I live for! I love it, it actually reminds me that I have to stock up on it before it’s taken off of the shelves. The Acai mask is also lovely, I bought it when the range first came out and I love to use it. Great post, lovely, I’ve now got to go to The Body Shop and spend!!! These look like great products. I need the Aloe Soothing Night cream! It is so refreshing and just such a great product to use! Love the body shop! Need to try more! Wow such an indepth review!! 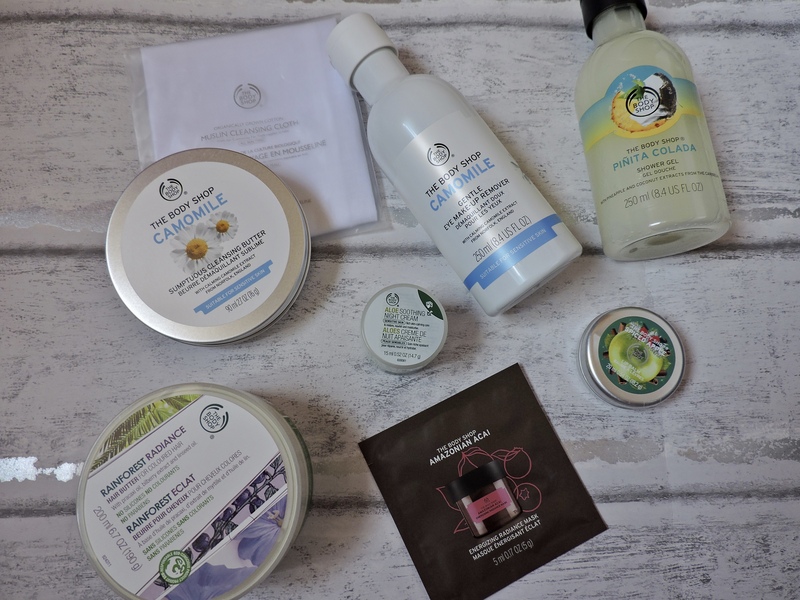 I love the bodyshop products and I think a lot of them are underrated! 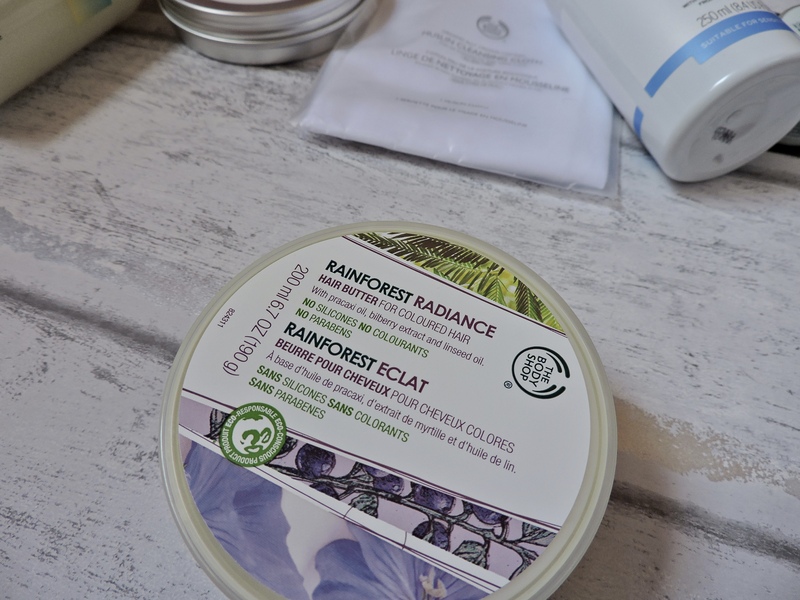 My favourite is the coconut body butter its amazing! I reeeeally have been meaning to try the chamomile range, as I’ve heard so many good things. My uktimate fave is the Hemp range, as it’s sooo nourishing, especially in winter! The body shop are great! You absolutely loved everything you got! 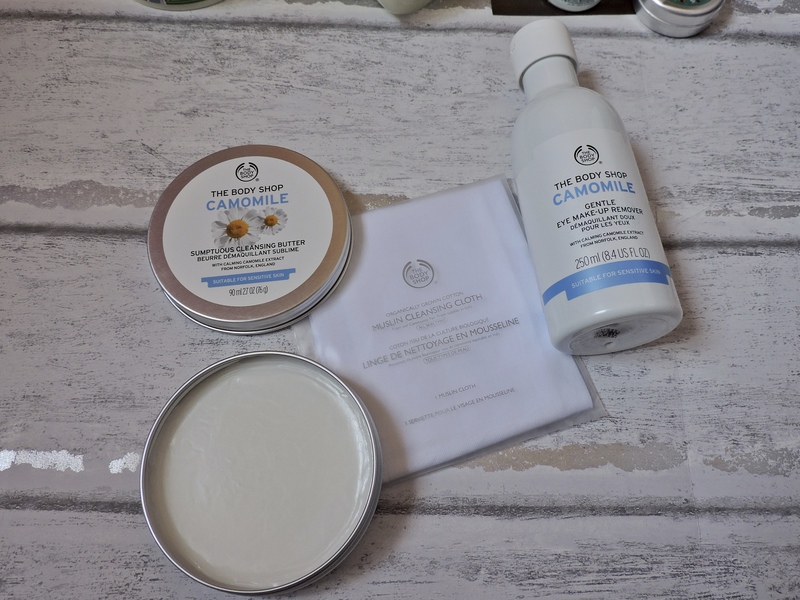 I really want to try that camomile range, I have very sensitive skin and it sounds great! I love the Tea Tree Toner from the body shop, you should definitely try it out next time you’re in! I loved everything that I got! I have sensitive skin too and it is honestly amazing for my skin. It keeps it so hydrated and moisturised, its so great! I am allergic to Tea Tree but I know that this is such a popular one from The Body Shop! thanks for recommending it though! That hair butter is exactly what I need! I’ve been swimming and my hair has gotten reeeeeally long, so I need to moisturize it much more than a normal conditioner can do. Can’t believe it was only £4! I like The Body Shop. I bought their Tea Tree set and really like it. I would love to try the Camomile products as well. They also have an Aloe set and a Seaweed set that I want to try also. 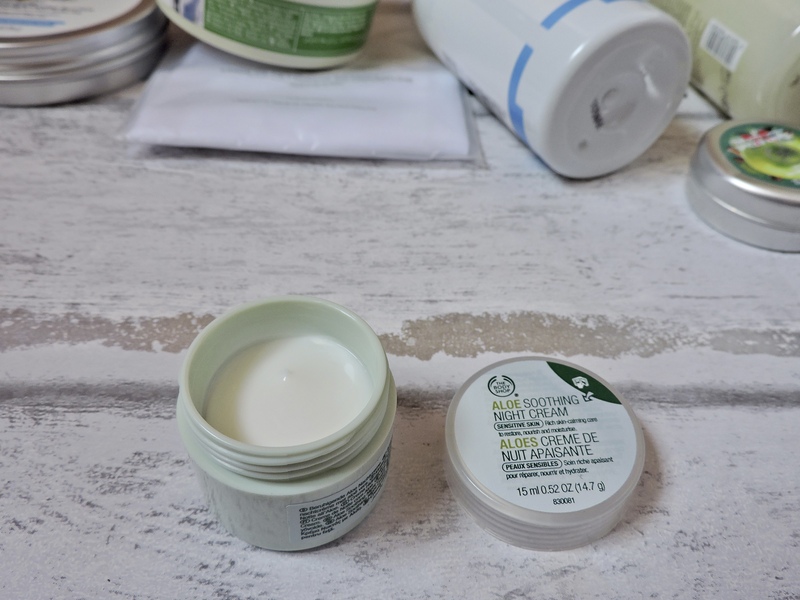 I absolutely LOVE the Body Shop products so of course I loved this post! That hair butter literally sounds amazing and I can’t believe I’ve never heard anything about it before! I need it in my life ASAP!